When we plan a trip, we often prepare a list to ensure a successful trip. Normally, we draw up a list of sub-topics, continue to branch out to many sub-sub-topics. Too much information can be a headache without the right tools. Auto Link is a great feature in ColorNote, it helps us move directly from the main note to sub-note. For example, you add a new checklist titled ‘My Trip’. You quickly type in the checklist such as Transportation, Budget, Restaurants, Hotels etc. 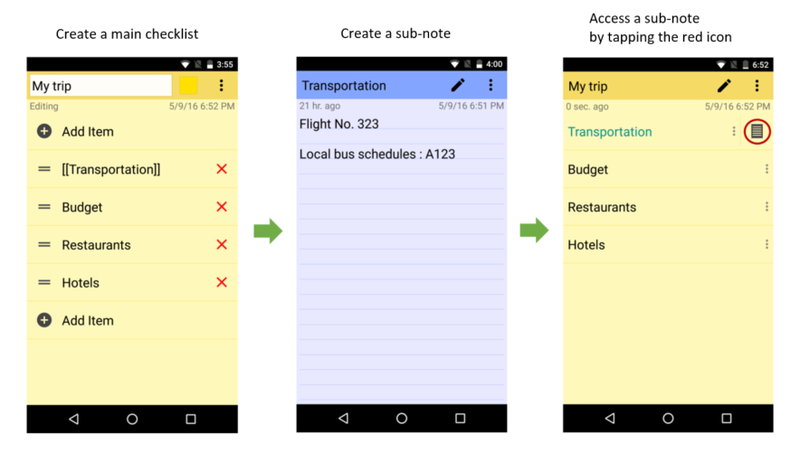 To remember the details regarding transportation, you create a sub-note and write the flight and local bus schedules. The note’s title should be ‘Transportation’. Then, you go back to the main checklist, you edit the words enclosing them in double square brackets: [[Transportation]]. Finally, each item of the checklist can access the linked sub-notes directly!